Etorphine (M99) is a semi-synthetic Edinburgh, led by Professor Kenneth Bentley. It can also be produced from thebaine. Etorphine is available legally only for veterinary use and is strictly governed by law. It is often used to immobilize elephants and other large mammals. Diprenorphine (M5050), also known as Revivon, is an opioid receptor antagonist that can be administered in proportion to the amount of etorphine used (1.3 times) to reverse its effects. Veterinary-strength etorphine is fatal to humans. For this reason the package as supplied to vets always includes the human antidote as well as Etorphine. The human antidote is generally naloxone, not diprenorphine, and is always prepared prior to the preparation of etorphine to be immediately administered following accidental human exposure to etorphine. One of its main advantages is its speed of operation and, more importantly, the speed with which diprenorphine reverses the effects. The high incidence of side-effects, including severe cardiopulmonary depression, has caused etorphine to fall into disfavor in general veterinary practice. However, its high potency combined with the rapid action of both etorphine and its antagonist, diprenorphine, means that it has found a place for capture of large mammals such as rhinoceroses and elephant; under these circumstances both rapid onset and rapid recovery are very important characteristics. The high potency of etorphine means that sufficient etorphine can be administered to large wild mammals by projectile syringe (dart). Large Animal Immobilon is a combination of etorphine plus acepromazine maleate. An etorphine antidote Large Animal Revivon contains mainly diprenorphine for animals and a human-specific naloxone-based antidote, which should be prepared prior to the etorphine. A 5–15 mg dose is enough to immobilize an African elephant and a 2–4 mg dose is enough to immobilize a Black Rhino. Etorphine is an agonist at μ, δ, and κ opioid receptors. It also has a weak affinity for the ORL1 nociceptin/orphanin FQ receptor. In Hong Kong, Etorphine is regulated under Schedule 1 of Hong Kong's Chapter 134 Dangerous Drugs Ordinance. It can be used legally only by health professionals and for university research purposes. The substance can be given by pharmacists under a prescription. Anyone who supplies the substance without prescription can be fined $10,000 (HKD). The penalty for trafficking or manufacturing the substance is a $5,000,000 (HKD) fine and life imprisonment. Possession of the substance for consumption without license from the Department of Health is illegal with a $1,000,000 (HKD) fine and/or 7 years of jail time. In the Netherlands, Etorphine is a list I drug of the Opium Law. It is used only for veterinary purposes in zoos to immobilize large animals. In the US, Etorphine is listed as a Schedule I drug with an ACSCN of 9056, although its hydrochloride salt is classified as Schedule II with an ACSCN of 9059. For both, the 2013 annual aggregate manufacturing quota for both was zero so presumably veterinary supplies of the hydrochloride are imported from Germany and/or the UK. In the UK, under the Misuse of Drugs Act 1971, Etorphine is controlled as a Class A substance. ^ Bentley KW, Hardy DG (June 1967). "Novel analgesics and molecular rearrangements in the morphine-thebaine group. 3. 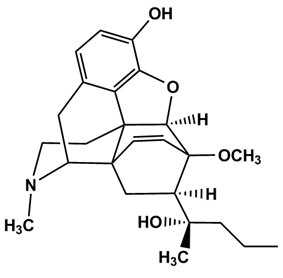 Alcohols of the 6,14-endo-ethenotetrahydrooripavine series and derived analogs of N-allylnormorphine and -norcodeine". J. Am. Chem. Soc. 89 (13): 3281–92. ^ Aggrawal A (1995). "Chapter 3 Opium: the king of narcotics". Narcotic Drugs. New Delhi: National Book Trust. pp. xvi+161. ^ Bentley KW, Hardy DG (1963). "New potent analgesics in the morphine series". Proceedings of the Chemical Society 220: 189–228. ^ "Etorphine HCl". Veterinary medicine for wildlife: immobilisation medicine for animals zoo animals. Zoo Pharm. ^ Hawkinson JE, Acosta-Burruel M, Espitia SA (February 2000). "Opioid activity profiles indicate similarities between the nociceptin/orphanin FQ and opioid receptors". Eur. J. Pharmacol. 389 (2-3): 107–14. ^ Lewis, J. W.; Readhead, M. J. (1970). "Novel analgetics and molecular rearrangements in the morphine-thebaine group. XVIII. 3-Deoxy-6,14-endo-etheno-6,7,8,14-tetrahydrooripavines". Journal of Medicinal Chemistry 13 (3): 525–527.